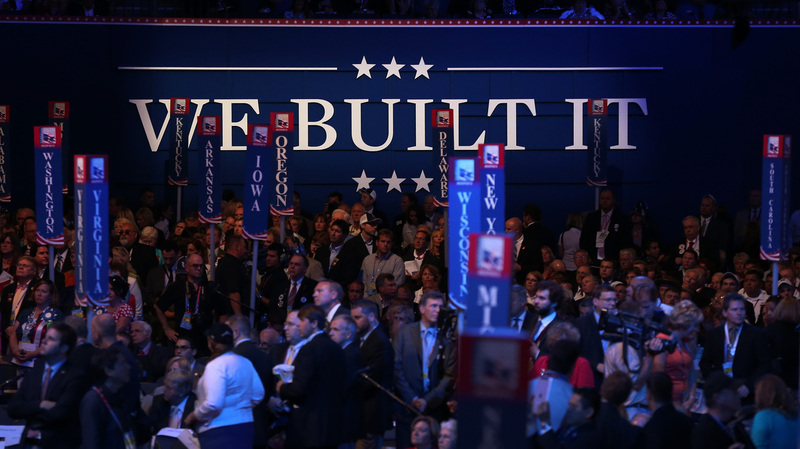 GOP's 'We Built It' Refrain Is Both Puzzling And Telling : It's All Politics The GOP's "We Built That" theme, which grew out of a gaffe by President Obama, all but took over the Tampa convention. Republicans say this line of attack, legitimate or not, highlights what they say is Obama's true attitude toward business. And they believe they can win by convincing the public that the president doesn't understand where jobs come from. Delegates filled the floor Tuesday during the Republican National Convention at the Tampa Bay Times Forum in Tampa, Fla. The 2012 Republican National Convention may have been the first gathering of its kind to take its theme from a gaffe. Some variation of the phrase "We Built That" was the theme of the first night but, in effect, dominated the stage rhetoric throughout the convention. The phrase was the only one heard as often as "Hurricane Isaac." The national party chairman, the speaker of the House, the keynoter and the vice presidential nominee all hit the mark like clockwork. Every major speaker on stage returned to the theme, talking about what they and others had built for themselves and how it was theirs and not the government's. Even Mitt Romney, in the final speech of the Tampa convention, said President Obama "had almost no experience working in a business ... jobs to him are about government." On the final night, delegates were shown a video of President Obama actually uttering the fateful words "You didn't build that ... somebody else made that happen" at a July 13 campaign stop in Roanoke, Va. Most reporters who were there took note of the remark, but in the context in which it was made — discussing education, infrastructure and other services that governments at various levels provide to make new businesses possible. "If you were successful, somebody along the line gave you some help. There was a great teacher somewhere in your life. Somebody helped to create this unbelievable American system that we have that allowed you to thrive. Somebody invested in roads and bridges. If you've got a business — you didn't build that. Somebody else made that happen. The Internet didn't get invented on its own. Government research created the Internet so that all the companies could make money off the Internet. The point is, is that when we succeed, we succeed because of our individual initiative but also because we do things together. There are some things, just like fighting fires, we don't do on our own." But that same weekend, the blogosphere and conservative talk shows picked up on the abbreviated version, making it sound as though the president was telling business owners they weren't responsible for their businesses, or entitled to the fruits of their labor. By choosing his words carelessly, the president had committed what amounts to a major gaffe in our politicized YouTube culture. Even a few inadvertent seconds of language can go viral and cause a storm. And it almost doesn't matter what the context is. In an unguarded moment, any political figure can create the material for a damaging campaign. Mitt Romney found that out in the early primaries, when cameras caught him talking about giving the boot to people who provided bad or overpriced services. At a breakfast on a January morning in New Hampshire, the candidate let the words "I like being able to fire people who provide services to me" pass his lips. And that is all that the makers of commercials and hit pieces for online consumption needed. Some of his primary opponents hopped on that bit of tape and rode it for days — even weeks — along with news people and lots of Obama's political allies. At the time, those who used the "like being able to fire people" tape had an argument they offered as justification. They said Romney was revealing himself with this offhanded reference to firing people. He must be some kind of Donald Trump, a plutocrat getting a charge out of giving people the gate. But after a while, other issues arose and the primary dynamic shifted. This summer, the controversy over "you didn't build that" has been a far more sustained phenomenon, even before this convention. While primarily limited to the conservative media, it has taken on a life of its own. The refusal of more mainstream media to take it as seriously has only made it catnip for those who do. And at the Tampa convention, this line of attack, legitimate or not, all but took over the proceedings. Republicans offer a justification similar to that used by Romney's tormentors back in the primaries. They say it reveals the true Obama attitude toward business, a cross between disrespect and outright hostility. And speaker after speaker here used the "build that" quote as evidence to this point. An array of small business owners were brought to the stage to explain how they had struggled to get their "mom and pop" operation up and running. Tom Stemberg, founder of the office supply store Staples, gave one of several testimonials for Romney on the final night. But he spent much of his time raking the White House for its supposed attitude toward business: "They just don't get it. They don't get it because they don't believe in the spirit of the entrepreneur. They don't understand what it means to risk money to create something new. They don't understand the hard work it takes to get a business off the ground." In Tampa, it became increasingly clear that Republicans, or at least those who attended this convention, truly believe this characterization of the president. They believe it's not just that Obama insists on some role for the public sector, or an equal partnership, but that he neither comprehends nor honors the contribution of capitalism and free enterprise. It is reminiscent of the rhetoric heard about socialism and the New Deal in the 1930s and 1940s and reprised a generation later in reaction to the Great Society. In those days, the phrase was "running government more like a business." Such talk had faded in recent years, at least temporarily, after the meltdown that began in late 2007 shook many people's faith in the wisdom of markets. But here in Tampa, the centrality of business and its needs and wants were front and center. Foreign policy was an afterthought in most of the presentations, including Romney's acceptance speech. Social issues were scarcely mentioned, rating a passing reference of less than a minute's duration in the nominee's finale. Yet Romney used the word business 17 times in that same speech. One of them was a reference to the "freedom to build a business." One more use of the most reliable applause line of this convention. If the economy is the top issue and jobs are the key measurement of the economy, the Romney Republicans believe they can win by convincing the public that the current president simply doesn't understand where jobs come from. The central theme of this week in Tampa is about to become the party's mantra for the fall.